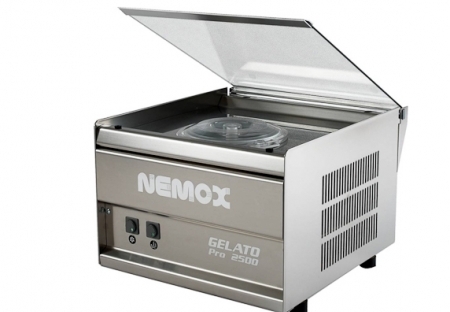 Pro 2500 is the most compact professional Gelato machine on the market. You can process up to 1.25 kg (1.2 Quarts) of mixture in a very small space, using either the fixed bowl made of 18/10 stainless steel or the handy removable bowl with handle for easier removal. The refrigeration and blending systems are designed for long work cycles. The plastic mixer blade is made of “POM”, a technical polymer that ensures hygiene and strength. Thanks to the unit cover, made of hardened glass, you can conveniently use the machine as a counter top when not in use. The bowl comes with a plastic lid. The machine body is entirely made of stainless steel. The blender motor is provided with an automatic reset thermostat.